Cameron Morrison (above) was defeated in the 1932 U.S. Senatorial election by Robert Reynolds. Image courtesy of the North Carolina Office of Archives and History, Raleigh, NC. Reynolds endorsed the Civilian Conservation Corps because it provided jobs for thousands of North Carolinians. 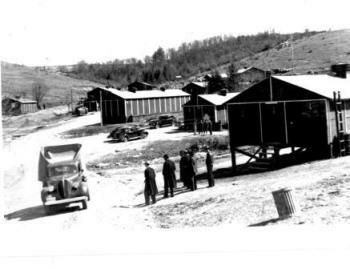 Pictured is a CCC camp in Laurel Springs, NC. Image courtesy of the North Carolina Office of Archives and History, Raleigh, NC. A most atypical southern politician and U. S. Senator from 1933 to 1945, Robert Rice Reynolds was an unabashed isolationist and Anglophobe, whose foreign policy positions, not economic ones, alienated him from President Franklin Delano Roosevelt. Reynolds’s notorious womanizing and five marriages, opposition to Prohibition, flamboyant actions, and non-racist demagoguery set him apart from the straight-laced, Tar Heel politicians, who supported FDR’s aid-to-Britain policies. Born in Asheville, North Carolina on June 18, 1884, Reynolds descended from a family of Revolutionary War heroes and pioneers, politicians, and propertyowners. He attended public and private schools before entering the University of North Carolina, where he played football, ran track, and edited the sports section of the Tar Heel. Yet, he left without a degree. Although accepted at UNC Law School, he attended lectures without being officially enrolled. Nonetheless, he was admitted to the North Carolina Bar and practiced law in Asheville with his brother before being elected prosecuting attorney. Registered for military service during World War I, Reynolds was never drafted, yet he served briefly in the National Guard. An unlikely candidate in the 1932 Democratic primary (he had lost several elections for public office, with the exception of prosecuting attorney) Reynolds, with the highest percentage in North Carolina history (65.4%), overwhelmingly and surprisingly upset the incumbent Cameron Morrison for a U. S. Senate seat. Exploiting the economic misery of Tar Heels during the Great Depression, Reynolds used class war rhetoric, portraying his opponent as a chauffeured-driven, caviar-eating, Big Business-backed plutocrat, out of touch with the electorate. Still campaigning in his worn-out Model T Ford against Prohibition (in a dry state), immigration, trusts, tariffs, and Wall Street, Reynolds easily defeated his Republican opponent in the general election. In his first term, the now expensively-attired Reynolds remained loyal to FDR’s New Deal, for he believed it provided economic salvation for his constituents by means of relief and much-needed jobs. Fully aware of Roosevelt’s popularity, the pragmatic senator, for example, endorsed the Civilian Conservation Corps (CCC) because it provided jobs for thousands of North Carolinians who constructed the Blue Ridge Parkway and the Great Smoky Mountains National Park. A Keynesian redistributionist eager to tax the rich and regulate the economy, Reynolds also supported Social Security, the Fair Labor Standards Act, the Works Progress Administration (WPA), Tennessee Valley Authority (TVA), and the Agricultural Adjustment Act (AAA)–which raised tobacco prices. He intitially supported FDR’s controversial court-packing plan, but he later joined most isolationists in killing the bill by sending it back to the Judiciary Committee. During the course of his twelve years in the Senate, Reynolds’s economic views changed from a New Deal liberalism (support for government intervention in the economy and to secure social justice) to a pro-business conservatism, but his foreign policy positions remained basically the same. His anti-communism notwithstanding, Reynolds supported Roosevelt’s recognition of the Soviet Union so that the communist nation might buy North Carolina goods. A staunch unilateralist, he opposed U. S. adherence to the World Court, for he considered it a tactic to enter the failed League of Nations. During his senatorial career, Reynolds advocated strict limits on immigration, the registration of all aliens, and the deportation of alien criminals. In particular, the nativist Reynolds deemed most aliens as a threat to American security, values, and jobs, so he co-authored the Reynolds-Starnes Bill (1936) that called for cutting immigration quotas by 90%. An advocate of “Fortress America,” Reynolds supported a strong national defense, naval expansion, and increases in the size of the army and air force. But like most progressive isolationists, he adamantly opposed Roosevelt’s efforts to revise the Neutrality Acts. Reynolds and Senator John Overton (La.) were the only southern senators to vote against repeal of the arms embargo. After handily winning reelection in 1938 and gaining a seat on the Senate Foreign Relations Committee, Reynolds–now less dependent on a president who had thwarted his patronage preferences–publicly split with FDR on foreign policy. Challenging Roosevelt’s claim that Adolph Hitler threatened American security, Reynolds compared the Fuehrer’s conquests to earlier American and British territorial expansion. Accusing the president of leading the nation into war, he denounced the “destroyer deal” and was the only southern senator to vote against the Lend-Lease Act (1941) and most of FDR’s aid-to-Britain measures. At the request of Army Chief of Staff George C. Marshall, Reynolds, now chairman of the Senate Military Affairs Committee, introduced and held hearings on the extension of the Burke-Wadsworth Act–the nation’s first peacetime draft. He unsurprisingly voted against it. A genuine believer in democracy, Reynolds’s controversial remarks were neverthless perceived by many as pro-Nazi and anti-Semitic. Even his legislation banning Nazi and Communist parties failed to rehabilitate his reputation, for his anti-immigrant proposals coincided with Jews fleeing Nazi persecution. Although an admirer of isolationist Charles A. Lindbergh and his America First Committee, Reynolds avoided affiliating with the nation’s leading noninterventionist organization because of its unpopularity in North Carolina. The senator even discouraged the organization from polling Tar Heels concerning a war declaration against Germany, for he feared it might reveal pro-war sentiment. His professional associations undoubtedly prompted perceptive criticisms of an underlying anti-Semitism. In January 1939, Reynolds formed the Vindicators Association, an ultra-nationalist, isolationist, nativist, anti-Semitic, and anti-communist organization which published American Vindicator to spread his opinions. Reynolds’s association with American Nazis, fascists, and anti-Semitic demagogues, including Gerald L. K. Smith and Fr. 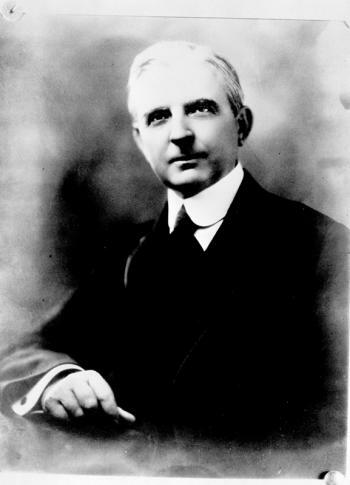 Charles E. Coughlin, revived accusations that he was pro-Nazi. But Nazi agents and propagandists, such as George Sylvester Viereck, had genuinely deceived Reynolds and other isolationist senators, when they inserted anti-British and anti-Semitic press releases into the Congressional Record and disseminated them via his franking privileges. Also, Fritz Kuhn, leader of the pro-Nazi German-American Bund, and Asheville’s leading fascist, William Dudley Pelley, and his Silver Shirts, endorsed many of Reynold’s pronouncements regarding the war; copies of American Vindicator were even sold at Bund rallies. Most North Carolinians held views that embraced aid-short-of-war as Britain’s situation became more desperate. A bastion of pro-military sentiment, North Carolina sent 361,000 of its citizens into the armed services and more soldiers were trained at its numerous military bases than in any other state. No doubt as a result, the state benefited enormously from defense spending. North Carolina businesses and farmers were awarded a fifth of all government defense contracts. Reynolds initially blamed London, not Tokyo, for the December 7, 1941, attack on Pearl Harbor. However, much like his fellow isolationist senators, he later voted for war against the Axis powers. After Pearl Harbor, Reynolds dissolved the Vindicators Association and renamed his nativist newspaper, which advocated national unity, the purchase of war bonds, a ban on strikes, the registration of labor unions, the relocation and internment of Japanese-Americans, and the renewal of Lend-Lease. Due to his unpopularity at home, Reynolds decided not to seek reelection in 1944. Instead, he became national chairman of the neo-isolationist, nativist, and anti-communist American Nationalist Committee of Independent Voters, out of which came his short-lived Nationalist Party in 1945. During his last year in the Senate, Reynolds presciently warned of Soviet expansionism and voted against peacetime conscription, higher taxes, and America’s entry into the United Nations. Following his retirement from the Senate, Reynolds briefly practiced law in Washington while living in Maryland. After the death of his fifth wife (who overdosed on sleeping pills), he returned to Asheville to raise his young daughter with the generous inheritance left by his wife. Bored and eager to return to public life, Reynolds entered the 1950 Democratic primary and came in third. This forced a runoff that probably cost the former UNC president and ultraliberal, internationalist interim senator, Frank Porter Graham, reelection. The Old North State’s most colorful and controversial senator died on February 13, 1963. He was cremated and then buried in the family plot at Riverside Cemetery in Asheville. Wayne S. Cole, Roosevelt & the Isolationists, 1932-45 (Lincoln, NE, 1983); Julian M. Pleasants, Buncombe Bob: The Life and Times of Robert Rice Reynolds (Chapel Hill, 2000); William S. Powell, North Carolina Through Four Centuries (Chapel Hill, 1989).